Tales of espionage in Bollywood seldom manage to arouse or sustain the tension that the genre demands. Director Nikhil Advani, however, delivers splendidly on this account, weaving a taut narrative complete with unpredictable twists and turns. Not only does he spin a thrilling tale, he infuses the story with sensitivity and emotion. Four RAW agents have been trained over the years for one specific task – capture India’s Most Wanted man and bring him back to the country alive, so that he can be punished for his crimes. Wali Khan (Irrfan Khan), one of the RAW agents who infiltrated into Pakistan, has spent the last nine years of his life there hoping to find a trail of the elusive Iqbal Seth. Just when the Indian sleuths are about to give up pursuit, the most-wanted Iqbal Seth (Rishi Kapoor) gives them a glimmer of hope. He is adamant to make an appearance at his son’s wedding. This is their only chance to abduct him. The team swings into action. 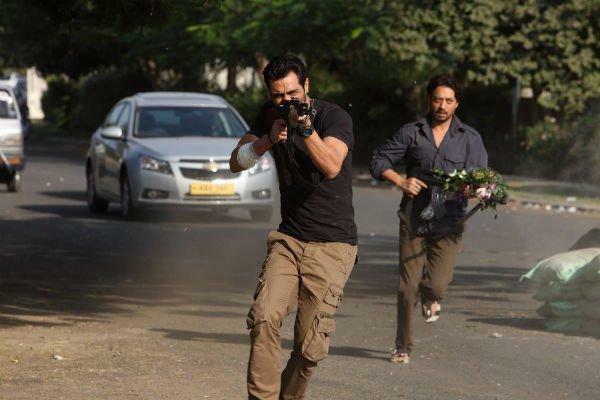 Rudra Pratap Singh (Arjun Rampal) and Zoya Rehman (Huma Qureshi) are key players in this covert operation. Rampal has often been criticized for being expressionless. However, in ‘D-Day’, this apparent criticism works to his advantage. As a former army officer and now an undercover agent, Arjun is intense and sharp, his body language apt and his performance precise. Huma is a pleasant surprise, especially in the action sequences. Irrfan Khan, as usual, delivers another ace with a well-nuanced performance. In the nine years that Wali Khan has spent in Pakistan, he has acquired a new life and his identity no matter how fabricated is as true to him as his own existence. Khan has a choice to make. Will his emotions supersede his loyalty towards his country? Irrfan’s silence and his skillful portrayal convey his internal conflict and his quiet resignation with equal effect. Here is an actor who is as believable as a barber as he is as a RAW agent. In this fast-paced action thriller, Nikhil Advani creates moments that remain etched in memory. There is a scene when Rudra exacts revenge for the ghastly scar on a beautiful prostitute’s (Shruti Haasan) face. The way water pours down his face in slow motion when he is washing off the blood is symbolic of the way gods are anointed with milk in India. Later, when Rudra recounts the horror that must have befallen his moll, it is a particularly disturbing scene but has been shot superbly. Shruti has a cameo but are eyes speak louder than any dialoguebaazi. I was a tad bit disappointed by the final scene but the director’s build-up to the climax is perfectly pitched. Nikhil Advani exhibits rare brilliance as he manages to sustain edge-of-the-seat suspense throughout. Watch it for an engaging story and engrossing performances.